Two US journalists arrested by North Korea near its border with China are to face trial, North Korea's state media has reported. 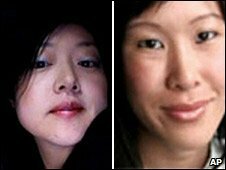 Euna Lee, a Korean-American, and Laura Ling, a Chinese-American, who work for Current TV, were detained on 17 March. The North said it had decided to charge the women after completing an inquiry into their "crimes" - although the precise charges remain unclear. The North says the two women illegally crossed the border from China. "Our related agency has decided to turn the US reporters over for trial based on findings of their crimes," KCNA reported. State media announced earlier this month that it would put the reporters on trial for "hostile acts" and illegally entering the country. The latest announcement appears to indicate an investigation has been completed to support formal charges, although what those charges are precisely remains unclear. The Associated Press says the women could face up to five years in prison if convicted of espionage. The journalists are believed to have been on the Chinese side of the border when North Korean guards arrested them and took them back to North Korea, although the North disputes this. They were working on a story about refugees fleeing the hard line communist North. Washington had initially accepted media reports that the two were being interrogated for espionage, but later said they understood the two were being investigated for illegal entry of North Korea. The US has no diplomatic representation in the North so has asked Swedish diplomats in North Korea to request access to the reporters. US state department spokesman Robert Wood said recently that the North had assured the US the detainees would be "well-treated". Mr Wood has repeatedly said the state department is trying to avoid commenting too much on the case in order to increase chances of a diplomatic negotiation to secure their release. Relations have also been tense across the border between North and South Korea, with the North refusing this week to release a South Korean worker. The BBC's John Sudworth, in Seoul, says there are concerns that the two reporters could be used by North Korea as bargaining chips at a time of heightened tension.